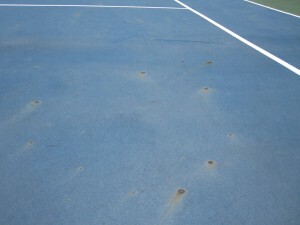 In various regions, rust spots are a common sight on tennis court surfaces. They are actually visible on driveways, parking lots, and other asphalt surfaces, but they are more pronounced on a colored tennis court surface. The rust spots are the result of metallic minerals, called pyrites, that contaminate the stone used to create asphalt. Asphalt pavement and acrylic tennis surfaces allow vapor to transmit, or breathe through them. When the mineral pyrites become wet, they rust and bring the stains upward into the acrylic surfaces. These rust stains are unsightly and mostly an aesthetic issue that don’t affect the ball bounce or play of the game. However, sometimes the aggregate reacts, swells, and pops out. This leaves a rust stain and sometime a small mound with a tiny hole in the surface. Talk to an experienced architect and/or tennis court contractor ahead of time in order to avoid the wrong asphalt type and source. 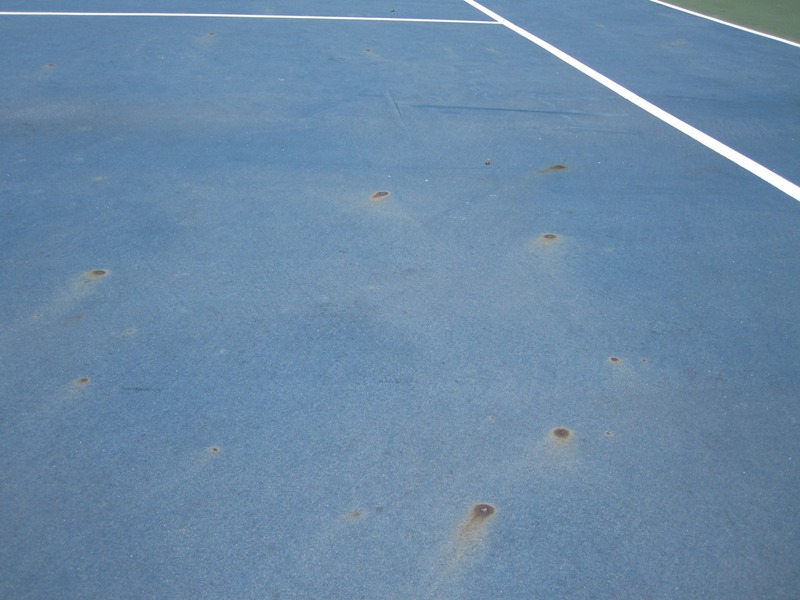 What causes rust spots on a tennis court? Your tennis court contractor can use a hand drill and drill out the reactive spots. 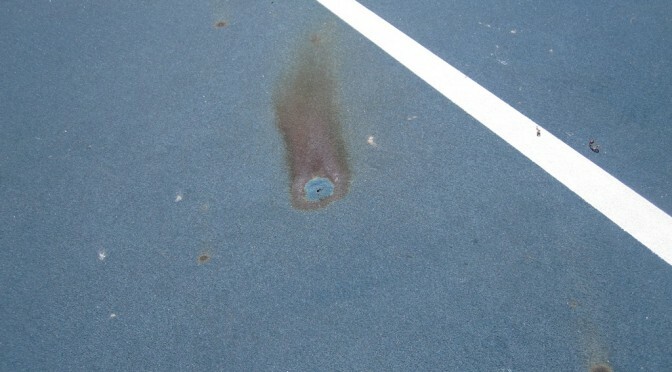 Acrylic Crack Patch can be used to repair the surface holes and the court can be touched up or completely resurfaced. Sometimes there are hundreds of rust spots and drilling is not always a viable option. For more information on this, fill out the contact form on this page and we will be happy to answer your questions or put you in touch with a local tennis court contractor. Previous PostKids Tennis | Adding Blended Lines for 10 and Under TennisNext PostWhat causes bubbles or blisters on a tennis court surface?